All we can do is research and define information from the best sources we can find, and then put that information together in the best possible way. We most certainly can have a difference of opinion, depending on our ability, but even between Rodney and I, such ability extends to just a few numbers upon a great circle...but who is right? We are both people with skills, but who gets to be accepted and who gets 'close to' but found wanting? I don't mind...the following image is the astronomical alignment to pyramid for the beginning of Precession's cycle, when Sirius is at its lowest position in the sky. Constellations in Egyptian asterisms. Pyramid aligned to the southern meridian...Cygnus is over on the northern meridian. 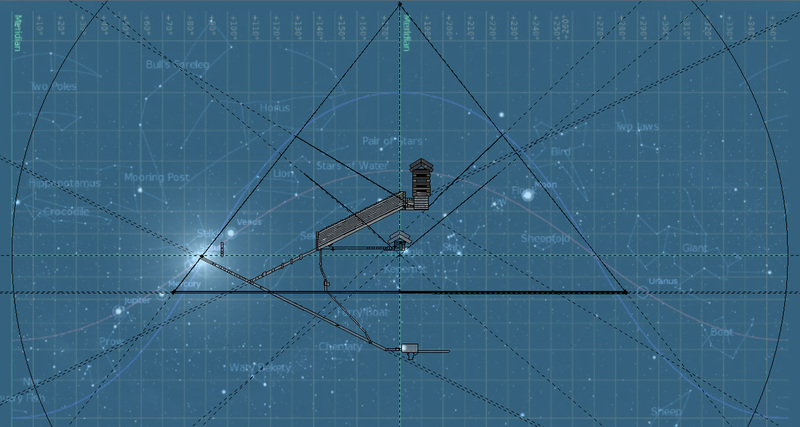 Possible to align pyramid to the northern meridian and then another compendium of architectural alignments arises. From the northern hemisphere, the sun is south, so south becomes important. From the northern hemisphere, the celestial pole is north, away from the sun, so 'the other place where the sun don't shine' becomes important. One direction is towards Sirius and Orion and the hidden Canopus, the other direction is towards Cygnus and its consorts. Isn't the bird supposed to be the harbinger of the dead to and from that other place? Can the pyramids represent two places at once? Three...given they are actual and on the ground...on Earth...hmm...all kinds of myths can be retranslated and shown to have more meaning than all kinds of professionals have interpreted...that's like having a few numbers different to someone else, but who is believed?